SOUHAIL'S PRACTICE CD FOR DRUMMERS AND DANCERS! 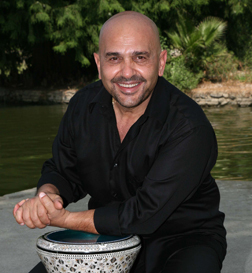 Grammy-nominated Souhail Kaspar is a master percussionist, known worldwide for his brilliant technique, exciting performances, and teaching skills. A true virtuoso, his ability to improvise and embellish the rhythmic patterns of Arabic music, as well as his knowledge of ethnic musical history, have made him one of the most highly acclaimed performer/instructors of our day. Born in Lebanon and trained at Nadi al-Fonun al-Arabia (Conservatory of Traditional Arabic Music) in Aleppo, Syria, he excelled in both classical and ethnic rhythmic patterns and techniques, and received a Degree in Classical Arabic Performance. He has traveled extensively during his career and has performed with artists such as Sting and Kenny Burrell, and with Arabic superstars such as Sabah, Feiruz, Cheb Mami, George Wassouf, Ragheb Alama, Kathem al-Saher, and Faiza Ahmed. Additionally, he has an impressive body of recorded work, including credits on the soundtracks for the movies The Prince of Egypt and Sinbad, the documentaries Darfur Now and The Great Bazaars, and as a guest percussionist with the cutting-edge Kronos Quartet on the CD Caravan. Since the late 1970s, Mr. Kaspar has also appeared with Dr. Ali Jihad Racy at a wide variety of cultural events and performed in major concert halls, master classes, and workshops throughout the United States. He has worked with legendary Egyptian composers Farid el-Atrash, Sayyed Makowi, and Hanni Mehanna. Mr. Kaspar is a recipient of a Durfee Music Fellowship given to master musicians and teachers. Currently, Souhail Kaspar lives in Los Angeles and is performing, recording, and teaching both nationally and internationally. His most recent recording is the acclaimed Khaliji CD, a collection of popular songs from the Saudi Arabian pensinsula.